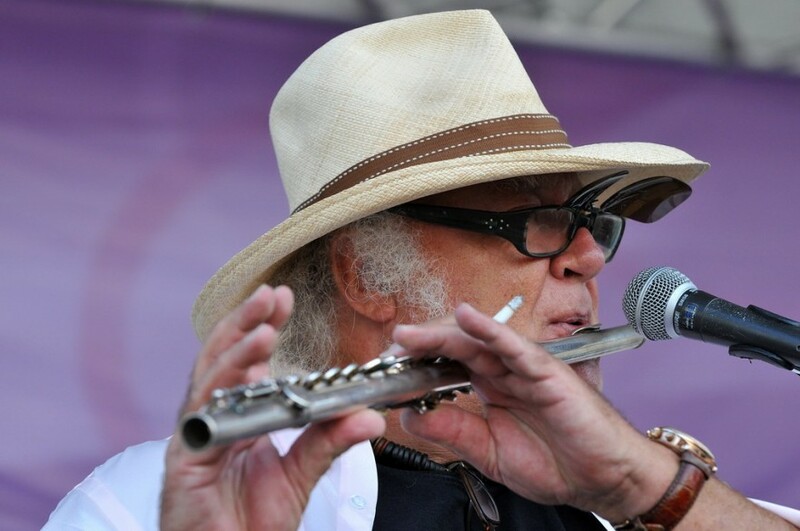 Van Leer was born in Amsterdam, and received his first flute at the age of eleven from his father, a classical flautist. He studied History of Art at Amsterdam University; after when he began studying flute and composition at the Amsterdam Conservatorium. He received a degree for flute from Geneva Conservatoire and also studied piano, orchestration (with Rogier van Otterloo) and organ (with Anthon van der Horst). While still at school, van Leer led a jazz group on piano. He went on to play the flute and sing with the Shaffy cabaret group. In 1969 he joined Martijn Dresden (bass) and Hans Cleuver (drums) to form a trio that covered songs by Trafficand backed other Dutch musicians, as well as playing their own material. Later in the year guitarist Jan Akkermanjoined, completing the initial line-up of Focus. They released several albums in the 1970s, earning two gold records (for “Moving Waves” and “Focus III“) which spawned the international hit singles “Hocus Pocus” and “Sylvia”. Van Leer headed Focus through several line-up changes, and by early 1976 he was the only remaining original member; the group disbanded in 1978. To date over five million copies of Focus albums have sold worldwide. Thijs van Leer’s 1973 “Introspection” solo album of classical flute supported by orchestra was also awarded gold record status, and the series of five Introspection albums has sold over a half million copies. He also worked and toured with Spanish singer Miguel Ríos, playing keyboards and flute, and appearing on three of Ríos’ albums: Extraños en el escaparate (Strangers in the Shopwindow, 1981), Rock & Ríos (1982; double album), and El rock de una noche de verano (Midsummer Night’s Rock, 1983). In 1985, van Leer briefly reunited with Akkerman to make Focus 1985. In 2002, van Leer created a new Focus line-up, which has since released the albums Focus 8 and Focus 9 / New Skin. A British tour was undertaken in spring 2006, and more regularly in subsequent years. He also appeared as a guest musician on the album, Into the Electric Castle, by Arjen Anthony Lucassen‘s musical project Ayreon. In 2008 Explore Multimedia released van Leer’s first solo album in nearly a decade, The Home Concert. The album featured recordings made in his living room as he played material for Focus 9. The album is exclusively available via the Internet, and at concerts. Van Leer has also experimented with sacred vocal music.